(l to r) Judith Ingber, Erin Weaver, Kevin Grieco, and Eric Messner. Photo by Michael Horan. Seeing a production at Glen Echo is not your average day at the theatre. Glen Echo is a park, often used for education; it has centers where people can take glass fusing classes, theatre, learn to paint and photography. You can ride the carousel, play on the pirate ship, see a puppet show or shop or just do what I did, see a dazzling, creative world premier theatre production. Written by Norman Allen and directed by the 10 time nominated, 4 time recipient of various Helen Hayes’ Awards, Holly Twyford, this production shows amazing creativity. The scenic designer Deborah Wheatley teams up with projections designer Hannah Marsh to create a stage that is both simple and high-tech. For This is truly a not to be missed show for parents and children. Particularly it is engaging, and funny and appropriate to bring any aged child but even a 2 year old will love it, and that is a rarity in live theatre. Music is directed by Wayne Chadwick and the audience is encouraged to join in. …a dazzling, creative world premier theatre production. When poor Rufus, played by the talented young actor, Sammy Strent is left with his unattentive uncle on Christmas eve, expectations of the whole Christmas tradition underwhelms Rufus and unhappiness ensues. The set showing a cozy simple livingroom, with a fireplace, decorated for Christmas but it is not the same as Rufus’ parents were called away on an emergency leaving 12 year old Rufus to create his own Christmas adventure. Aggravated by Rufus, Uncle Otis played by Eric Messner, throws a lump of coal away and through the magic of Christmas it gets turned into a vivacious female human form. She emerges as a singing, breathing creature, just beaming with excitement. She wants to be useful and loved, and attempts to get a job as an actor, but is turned away because she is judged to be a lump of coal, although the audience can see she can sing, dance and tells a good joke. There is prejudice here friends and it is just not fair. Meanwhile back at home Rufus is bored and lonely and is given a 600 page classic book, Don Quixote, to entertain himself with, which he promptly colors the pages, and his etchings are seen on the wall above through the magic of something called technology which to me, is still magical. A lump of coal is what parents have threatened naughty children with to keep them good throughout the holiday season. In Adventure Theatre- MTC’s A Lump of Coal, the lump of coal has some very different ideas of what uses she may have. Norman Allen has anthropomorphed the lump of coal by way of Christmas magic into a thoughtful, talented being who just wants to be useful. Erin Weaver is the perfect character, as she is energetic, soulful, and has a delightfully rich singing voice. She can recite Hamlet, tap dance and has a magical cane. Acting to an audience with an age ranging from 2 to 80 can be daunting. You never really know how a young child might react, and going with the flow, this cast really knows how to involve its audience and is adaptive and kind. When a child let out a rather piercing yell, our lump acknowledged it by saying “that is exactly how I feel.” It is the perfect show that you can take your young children or grandkids to and not worry about if they will behave. This show will capture even the youngest vixen’s attention. Judith Ingber plays several different characters from theatre director to restaurateur to gallery owner and her disguises and voice impersonations are hilarious especially to the adults in the audience. She glides from one character to another, but you always know if she is the interviewer for the job, that our “lump-a-lishous” friend doesn’t have a chance. We learn when Uncle Otis gets a job as a fake santa, he brings our human lump of coal home to be a gift to his nephew as a type of punishment for being so demanding and ungrateful. However, without giving away the ending, Rufus makes creative use out of his gift and indeed careers are captured for both. A child in the audience, Esme described to me what she liked best, and she said she liked the lump of coal best and adored the show! 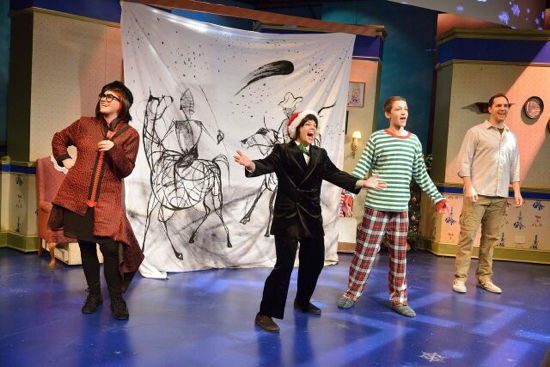 A Lump Of Coal For Christmas runs through December 31, 2015 at Adventure Theatre-MTC, 7300 MacArthur Blvd., Glen Echo, MD 20812. For tickets call the Box Office/Main Phone: 301.634.2270 or click here.